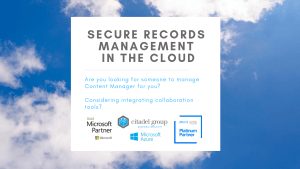 Citadel and Microsoft are hosting a Secure Information Management in the Cloud Webinar on April 16 at 12pm. Click here to find out more or register. Citadel and Microsoft are hosting a Next-Generation Enterprise Architecture Management information session on May 7 in Sydney from 12pm – 2pm. Click here to find out more or register. Citadel and Microsoft are hosting a Next-Generation Enterprise Architecture Management information session on May 14 in Melbourne from 12pm – 2pm. Click here to find out more or register. We are thrilled to invite you to Micro Focus Realize 2019 to be held in Melbourne, Sydney and Canberra – a free one-day software experience for business leaders and IT professionals. Citadel and Kapish are attending and speaking at Micro Focus Realize 2019 on 28 May (Melbourne), 30 May (Sydney) and 4 June (Canberra). Citadel and Kapish are attending RIMPA Live 2019 – the premier education and networking event for Records and Information Management Professionals Australasia (RIMPA). The convention provides industry professionals with an unparalled forum for disseminating and exchanging cutting ideas and knowledge. Click here to find out more or register.